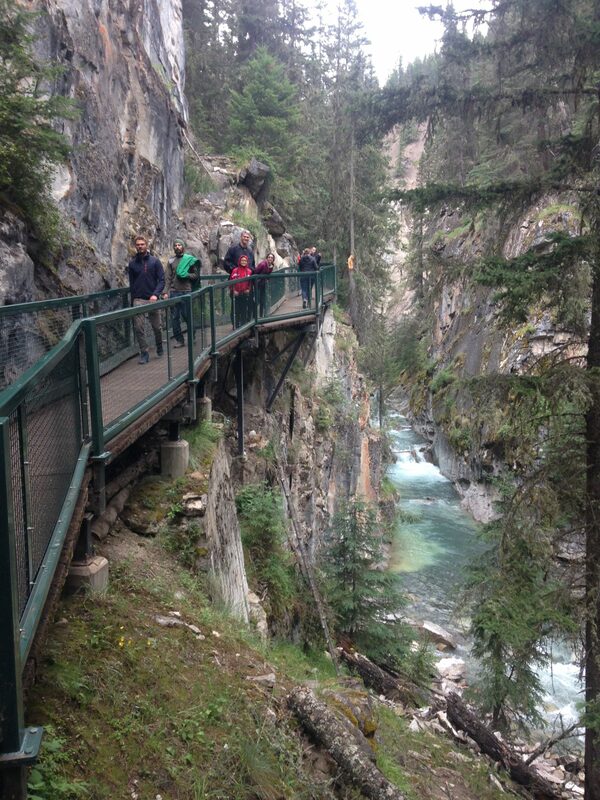 We were not able to hike Johnston Canyon yesterday, so that was our first stop of the day. To get there we took the scenic Bow Valley Parkway. I am really enjoying all the signs that are in English and French, and Makayla is having fun practicing her French as she took it as an elective last year. I love this road, as it meanders back and forth it occasionally splits in two, so your side of traffic is all alone. It is like having your own one lane normal speed raceway through a gorgeous forest. We get to the canyon, park and proceed to hike up. All I have to say is thank God my fear of heights and unstable things like gondolas and elevators is getting better as I age and not worse. This trail might even be hard for some people with vertigo issues. No matter what if you are in the area you definitely need to do this hike. Parts of the trail are attached to the side of the mountain and you are basically hanging over the water. I kept praying that whoever designed the walkways had a good grasp of physics and planned for 2 tour buses to arrive at the same time, because there was a lot of weight on those things. The first one had a few loose boards, so it was not confidence inspiring, but I managed. At the end there is a cave you walk through to get blasted by the mist of the waterfall. Our next stop took us over Yoho Valley Road, which is listed as one of the most dangerous roads in the world. I chuckled about this after we passed by the one set of hard switchbacks. I guess some people get really freaked out by steep curvy roads, but it is by no means dangerous. 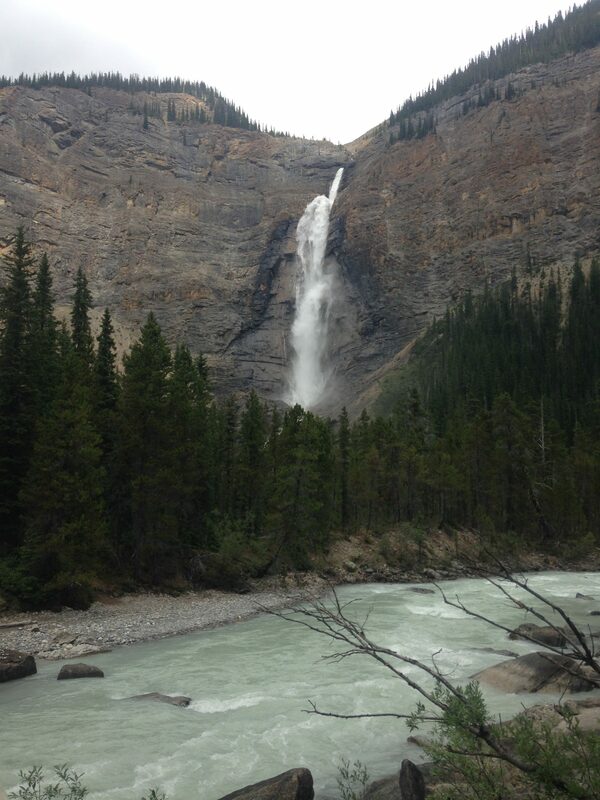 We eventually get to Takakkaw Falls, which is the second highest waterfall in Canada. The other fun thing was we found another set of those big red chairs! We are getting good at this game! We then needed to back track and start heading back south again to try to fit in things we had passed. We stopped by the sprial train tunnels, hoping that a train would go by, but we were not that lucky. I also forgot to take a photo of the area, but basically it is a set of spirals of train track that go in and out of tunnels to help trains get over the steep Kicking Horse Pass (another great name). Check out the link for some cool history about the project. 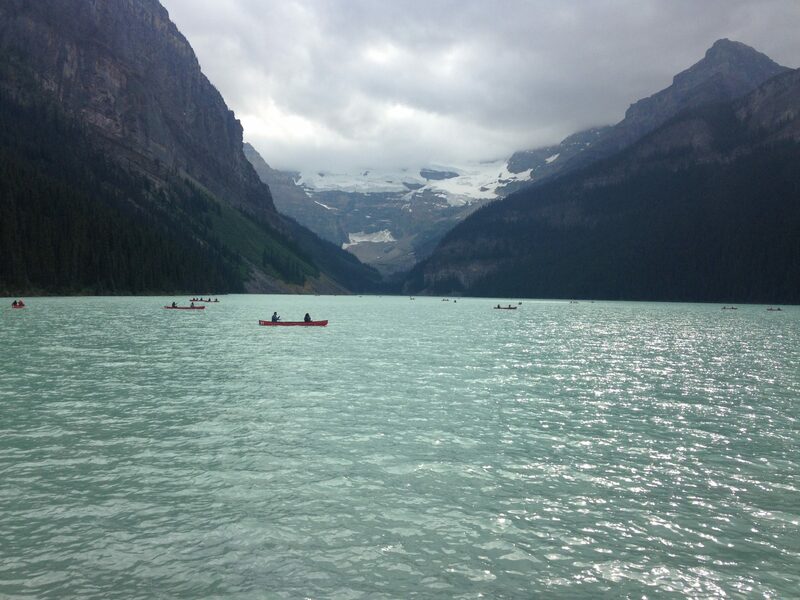 Our final destination of the day would be Lake Louise. My pictures don’t do it justice, especially because of the time of day and it was a little grey. But looking at the lake you get a sense of magic about the place I think because the color of the water is so different, I believe Willy Wonka would approve. There is also a Chateau that looks like something out of a movie. Everything looked almost too perfect. It was a perfect ending to our day. That would be me. I’ll have to take a pass, thank you. Really enjoying your blog, keep it coming.